I love Elvis Aron Presley’s music so much so that if you were to call up XM radio and ask them who’s car shark receives the all Elvis radio signal the most, it would be unthinkable for the dj to answer with anything other than my silver Jetta! In the summer of 2007, I was fortunate to be selected by my sorority to visit the foundations of our National Philanthropic cause, the St. Jude Children’s Hospital in Memphis, to learn about the hospital and Danny Thomas’ pledge through current patients, survivors and their families. One night, the group of TriDeltas were treated to a tour of Elvis’ mansion and lavish grounds. Although I was an avid fan before departing the bus for the gates of Graceland, discovering that his downstairs bath was decorated with pink poodle wallpaper, that his favorite sandwich was peanut butter and banana and his favorite meal meatloaf, I couldn’t help but be amazed at our likenesses (while we share the same penchant for decor and food, arguably, he was a better signer than I!!!). The more I learned about Elvis – his time in the war, his black belt in karate, his spirituality, I began to realize that the Elvis most people idolize is the Elvis they saw on tv, movie posters. The true Elvis was a man so much more than his music, and you can know that when your repertoire of his songs moves beyond Jailhouse Rock. His gospel, like my favorite tune, “In the Ghetto”, is so under-appreciated, something Elvis sorely knew: After his cataclysmic success in the 50’s and 60’s, Elvis’ debut as a Vegas mainstay must have been devastating and exhausting. Not unlike any other celebrity, the press, the public, were harsh. His swiveling hips were not the hit they once were, twenty years ago, fifty pounds lighter. That morning he played racquetball, as usual, in reportedly in high spirits – no need for drugs (unconfirmed overdose rumor). He was overweight but not so much so, and he was physically fit enough to rule out the immediate danger of a heart attack (officially what caused his “death”.). He hadn’t ordered a single costume for his new tour, to begin that day in Kalamazoo, MI. Even a novice knows Elvis was a loud dresser; he would never start a tour with the same costumes as the last. His name is misspelled on his grave marker. Elvis was a very spiritual person, he knew the heavens would know better than those of us here on Earth and didn’t want to compromise himself when his death did come one day. Additionally, Vernon, his father, had thrown a fit when the hospital where Elvis was born printed the name “Aaron” instead of “Aron”. Why would his father, who buried him, allow this injustice in death? Simple. He wouldn’t. Shortly before his “death”, Elvis cut friends and family members out of his will for writing a defamatory book. He also made inexplicable cuts and appeared to be investing in invisible markets, perhaps stowing away a savings for the years of his life after August 16th, 1977. The next day, August 17th, Elvis boarded a plane from Memphis (eye witnesses say they would have sworn it was Elvis had he not “died” the day before) for South America under the name John Burrows, the name he frequently used while traveling. In the months before August, Elvis began to visit a local Memphis hospital frequently. He is rumored to have taken a man, sick of cancer, who resembled Elvis to the point that was necessary, under his wing. This man had no family to speak of and no funds for his burial. 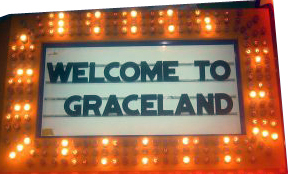 Elvis removed him from the hospital, paid the bill, and took him to Graceland to die. Elvis was photographed little during this period, as he was on break from tours. This man was found face down on the ground (it is uncontested in the police report that the man in the bathroom had traveled to get there (from the bed, presumably), clutching the Bible (Elvis was into Buddhism at the time, he would not have been reading the Bible). A quick study of the cause of death was done on the body and that same day the man was buried. Now, this man was only found in the bathroom, collapsed, at 2:30pm. He was officially pronounced dead at 3:30pm that day. Tests were done and he was buried on the same day. How often do you hear of someone dying late afternoon, undergoing an autopsy and being buried , all in the span of a few hours? Never. Especially a man of such super-star status. Never. And so it is easy to understand that someone at the hospital was in on this scheme too. How else do you remove a dying man, unrelated to you, from a hospital? How else do you explain the conflicting hospital and police reports and the swiftness of the whole afternoon? A handful of people, perhaps including Lisa Marie, who was at Graceland that day – her appearance there was a rarity, why she was there, other than to be a part of the this scheme, is a mystery – knew Elvis’ desire to leave the life he led as a sueprstar. The man was originally buried in a public cemetery in Memphis, but fans wanting to dig up the grave in disbelief led the family to move the body and marker to Graceland. Surely, a stranger buried near Elvis’ house was not in the plan, but to avoid complications and the whole mess unraveling, it was necessary for Vernon to orchestrate the move (in the middle of the night) for his son to live on. And Elvis? Well surely he traveled a bit, as incognito as he could. It is rumored he then settled in Michigan, where he was set to perform on August 16th. He had toured Michigan more than any other state and always remarked at the character of the people there; character enough to protect a friend they loved evermore. Many things have been written about Elvis’ death and the conspiracies will live on just as the ones surrounding JFK’s assassination will, too. Music has been recorded, supposedly by Elvis in 2001, and books so close to uncovering the truth shut out of publishing deals by major players in this coverup in the 80’s and 90’s, it’s unthinkable to think that Elvis died on that day. Wouldn’t it be over and done with by now if he did? Over the years, many of the main characters in his life have receded into the shadows or passed away, so many secrets left untold. True fans respect his privacy, and since the day he “died” have made pilgrimages to Graceland to pay tribute to his life, not death, even on this day, where 20,000 people hold candle light vigils. The question as to whether Elvis is alive or not today, August 16th, 2011 is irrelevant. He may have passed in the 70’s, the 80’s, the 90’s. He may be alive today. All of this is unknown to the general public, and insignificant to his fans. One thing is for sure, today we celebrate the life of Elvis. LONG LIVE THE KING OF ROCK ‘N’ ROLL!! !